From March 14 to 16, “G20 meeting of ministers of energy and environment” was held in Makuhari, Chiba prefecture. In the morning of 13th, I met with Prof. Sachs and discussed about the latest Global Health Summit, as well as the announcement made by president Bush during his visit to Africa, on additional support for Africa on neglected infectious diseases other than HIV, Malaria, and tuberculosis. We also discussed about various types of ODAs, supports that can produce visible outcomes, and how we could best fund them. From late afternoon, a meeting organized by Columbia University was held in Shanghai, to which I was invited, but unfortunately had to be excused. I then rushed to the 3rd meeting of GIES, “GIES2008.” “GIES2007” held in June 2007, and there my talk on “Innovation25,” is available on webcast. In the morning of March 14, I had breakfast with Honorable Malcolm Wicks, Minister of State of Energy of the United Kingdom, who participated in the “G20” meeting. 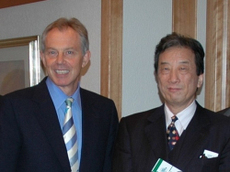 In the late morning of March 15, I with several others met with Mr. Tony Blair, prime minister of England until last year (Photo 1). 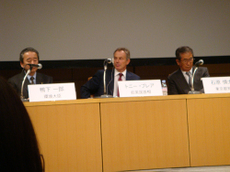 Mr. Blair delivered a keynote lecture early in the morning at G20 meeting. We discussed primarily on climate change and its policy of upcoming G8 Summit, China policy, issues on developing countries, and other related issues. Mr. Blair highlighted the topic of climate change for the first time at his Gleneagles G8 summit in 2005, and since then he is sincerely working hard to follow up the theme. 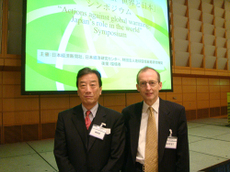 He works closely Davos meeting, and co-presided a lecture given by prime minister, Mr. Fukuda, this year’s Davos meeting. Mr Blair has continued his effort through various mechanisms to work on thi and other major global issues. I have been invited to join his team and am looking forward to participate in this honorable endeavor. Mr. Blair will head to next destination, Beijing and New Delhi, and I have already starting to correspond with his staffs by e-mail. No time to waste! 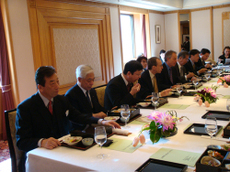 March 16, lunch at “Global warming symposium” organized by Ministry of Environment, Tokyo, and Nikkei (photo 2), followed by keynote lecture by Mr. Blair, and a panel by Mr. Kamoshita, Ishihara, etc (photo 3). Excerpts will hopefully appear in Nikkei Shinbun sometime soon.